If you still have line of sight from the new location, the signal strength should be virtually identical to what you had before (given the same type of antenna). The real question is if you will have line of sight to at least one of those locations (that's all you want to shoot to). So, standing at your new antenna location, look and see if you can actually see (visual) each of those destinations. Of course, clouds and weather may prevent you from actually seeing it, but you should be able to look in that direction to determine if there is anything blocking. As to actual signal strength, that will depend on what antenna you use. You have several choices from a 30dbi dish to a 19dbi panel. The higher the dbi number, the more gain, hence more signal strength, you will have. What type of antenna did the person who came out before use? Was it an actual dish (round or oblong), was it a flat panel roughly 12" square, or was it a flat panel roughly 4" square? The smaller should work well for Beacon. The larger 12" flat panel should work for Gold and maybe for Haystack. A 30dbi dish will absolutely work for Haystack. 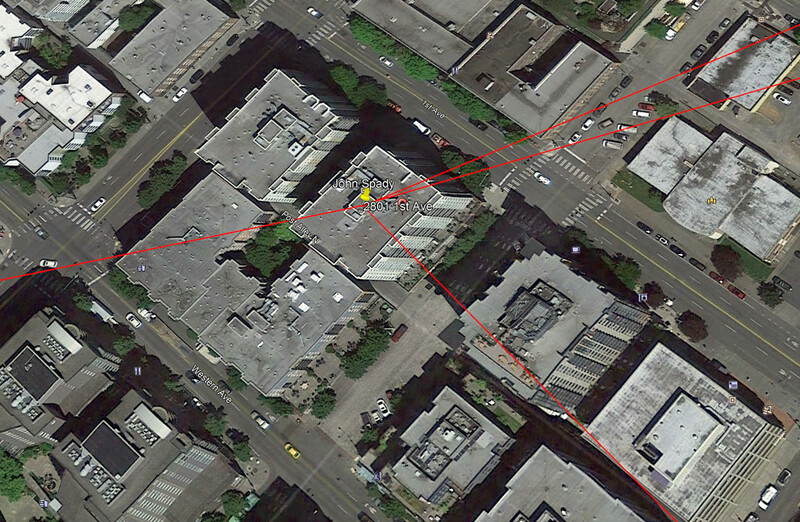 Attached is a screen capture of Google Earth with bearing lines to each of the following from the center of your roof, going clockwise - Haystack, Capitol Park, Beacon, Gold. From where you plan (are able to) mount your dish, which of those is the best to use? If you got a decent signal from a previous test, I have no doubt you can get a good signal from another test. The real question is exactly where will you mount your antenna, what will it be mounted to (how secure), how much clearance is there around it, and what (if anything) is in the way of one of the paths on the attached screen captures? Shooting to Beacon is probably your best option if you have a clear path. That is close by, so much stronger signal (and smaller antenna needed), plus it has paths to Baldi, Gold and Haystack - so lots of redundancy. Shooting to Gold would be my second choice. Shooting to Haystack would be my third choice, and shooting to Capitol Park my fourth choice. The last two have less reliability than the first two (longer shot to Haystack, Capitol Park shoots to Haystack so is just one more thing in the middle of going to Haystack). For Beacon, the two buildings directly to your south might be the obstacles you have to avoid. If you can get past/over them, you should have no problem. One of the small 4" square panels mounted on top of a pole as high as you can get it might serve your purpose. I'm happy to stop by some day with a 12" and 4" panel to test with. I've got a bigger dish, but it is cumbersome and hard to move. If you'll cover the cost of parking, I'll make the trip. Hello folks, I had a person (whose name I can’t recall unfortunately) come out to my condo building a short time ago and take signal strength reading to various HamWAN sites in the area (gold/beacon/and haystack). But my original plans for the antenna location have changed and I really need someone with a portable system to visit again and take some readings from a new location on my condo roof. 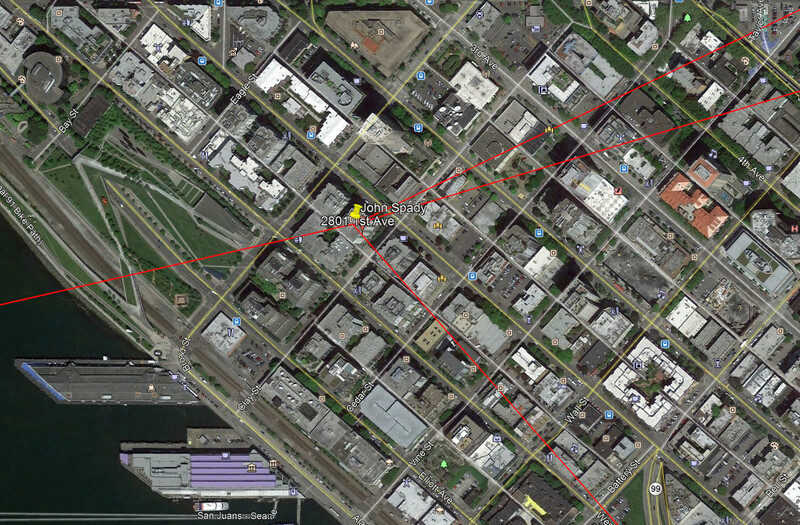 I live at 2801 1st Ave, in the Belltown neighborhood of Seattle. I could also use a materials inventory list or an Elmer kind enough to stop by and help me figure it up. I will compensate for someone’s time if that would help get someone here.